The discovery will provide further impetus for China’s deepwater drilling operations in the South China Sea. China National Offshore Oil Corp. (CNOOC) has announced its first deepwater gas field discovery in the South China Sea, Xinhua reports. The discovery was made by CNOOC drilling rig HYSY 981, the same drilling platform that sparked a diplomatic spat when it was parked within waters claimed by Vietnam as part of its exclusive economic zone (EEZ). CNOOC is especially pleased with the expected volume of the Lingshui 17-2 gas field. 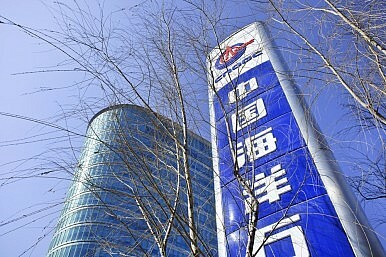 CNOOC manager Xie Yuhong was paraphrased by Xinhua as saying that “the well would produce 56.5 million cubic feet of gas per day, equivalent to about 9,400 barrels of liquid oil per day.” Xie also said the gas field “could be very large,” which Xinhua defined as “generally” meaning “at least 30 billion cubic meters” of gas. The discovery is still awaiting further testing to confirm the estimates. Xie noted that this represented the highest gas flow of all the the gas wells tested by CNOOC so far. Presumably, one of those tested wells would be the one CNOOC was working on near the disputed Paracels Islands earlier this summer. In that sense, the announcement regarding Lingshui 17-2 is good news for China-Vietnam relations, as it seems CNOOC did not find the controversial drill site to be as promising as the gas field near Hainan. However, CNOOC’s chairman Wang Yilin has also made it clear that exploitation of Lingshui 17-2 is just the beginning. Wang expects the discovery of that particular gas field to open the door to more exploration in the entire South China Sea. In the long-term, then, we should expect more repeats of this summer’s diplomatic tensions. In another sign that CNOOC wants to step up exploration of the South China Sea, the Wall Street Journal noted last week that the company was inviting foreign firms “to bid on an unprecedented number of oil and gas blocks off the Chinese coast.” CNOOC announced that it was offering 33 offshore oil blocks for bidding, up from 25 last year. Still, to date there has been very little interest by foreign companies in bidding on these blocks, given the high exploration and development costs. The increased number of blocks available for bidding may be in reaction to recent news that Vietnam and India have agreed to expand their cooperation on oil and gas production in the South China Sea. China has warned the Indian company involved, ONGC Videsh Ltd., that such activities violate China’s sovereignty. All signs point to an increased appetite for deepwater drilling within China. In addition to HYSY 981 — China’s first deepwater drilling rig — CNOOC has three more rigs of the same size in the works. The next such platform, the HYSY 982, is expected to be finished by 2016, according to the Wall Street Journal. China’s rapidly growing interest in deepwater drilling represents a convergence of two of China’s major strategic interests: protecting its claims to much of the South China Sea and reducing China’s growing reliance on imported energy. Exploration for deepwater oil and gas reserves help China demonstrate its control over contested regions of the South China Sea, while also allowing China to discover (and eventually extract) badly-needed energy sources. Vietnam has issued strong protests over the presence of a Chinese drilling rig near the Paracel Islands. China-Philippines Relations: Can the 'Rainbow' Last?Duterte's China Convergence ContinuesAhead of Drills in South China Sea, Chinese Foreign Minister Visits VietnamChina 2017: Year in ReviewDid China 'Win' at the Manila ASEAN Foreign Ministers' Summit?